If Canadian winters are notoriously cold, the unique Hôtel de Glace in Québec makes the best use of them. Built of ice and snow from top to bottom, the hotel is an architectural marvel and a breathtaking sculptural beauty – the only construction of this type in North America. Located 10 minutes from downtown Québec City, Hôtel de Glace is a major touristic attraction, made even more enticing by the fact that it has what other hotels don’t – a short lifespan. Due to the temperamental nature of its material, the hotel is available for only a few months every year. Hôtel de Glace usually opens its doors in early January and closes them at the end of March, when the hotel is taken down. It takes about a month and a half each year to build the hotel. It all starts with a metal frame on which human-made snow is blown and allowed to harden. When the frame is removed, the hotel reveals itself in all its splendor, with four feet thick walls, high arched ceilings and an unmatchable potential for creating ambiance. The design and architecture change from one year to the other, along with its theme, so that returning guests never run out of things to discover. Since the first time it opened its doors in 2001, the hotel increased the number of its rooms, now at 44, including themed suites. The hotel also includes an ice cafe and bar. A guided tour is provided and ends with guests learning how to make their own ice glass. In order to remain authentic, even the furniture and beds are made of ice. However, wooden bedsprings, mattresses and arctic sleeping bags keep the cold at bay, and the bathrooms, located in a nearby pavilion, are heated. Guests may or may not have the best sleep, but the hotel gives them the chance to enjoy cocktails served in ice glasses at the hotel’s bar, take a break from all the layers of clothing in the whirlpool tubs, have some fun on the hotel’s grand ice slide or simply enjoy the ice sculptures and abundant photo opportunities. Which more than makes up for a night spent on an icy bed. 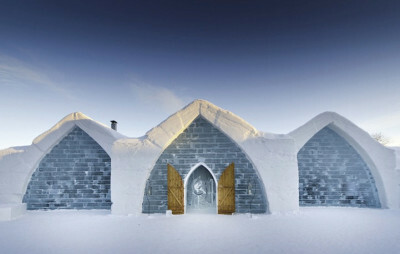 Hôtel de Glace is a veritable winter wonderland and a surprisingly romantic venue. It may be the outlandish concept, the ice chandeliers or the coziness of the fireplaces. Whatever it is, the hotel also has a wedding chapel, long declared a “dream location” for tying the knot and the perfect suggestion for the magic appeal of this place.